Todd Mason is assembling the links for Friday’s Forgotten Books at his blog Sweet Freedom, in the absence of Patti Abbott who usually does the honours at Pattinase. Ray Bradbury writes like a poet, which is not surprising as he has admitted to being influenced by his favourite poets and reading poetry every day of his life. The Fog Horn, a science fiction story he wrote in 1951, is a good example of his lyrical prose. Consider this passage. The “lonely animal” is a sea monster which is attracted to the “deep cry” of a foghorn in a remote lighthouse. 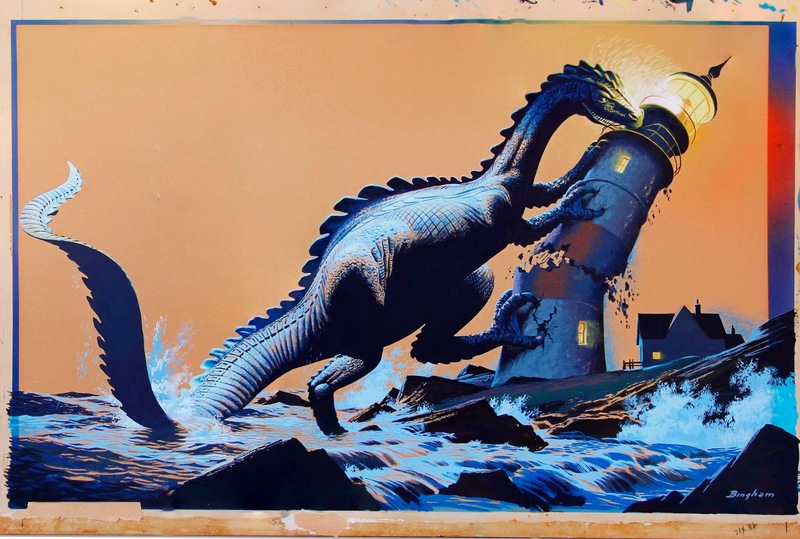 The mysterious giant—a Loch Ness or a Godzilla or a dinosaur of some sort—comes out of the deep sea on the same night once a year to visit the lighthouse and cry out in unison with the foghorn. But things don’t go as planned on that fateful night, three years later, when McDunn, the veteran, and Johnny, his junior and narrator of this story, lie in wait in the high tower. When the monster comes out of the sea, in the dark and stormy night, and hears the foghorn blow, it answers back. Here, Bradbury’s description is again poetic. The sound of the foghorn comes and goes and over time it arouses feelings in the monster living under the icy depths of the sea, because their cries sound exactly the same. The monster thinks it has found one of its own kind but the lighthouse doesn’t respond to its romantic wailing. The monster, as you might have guessed from the picture, doesn’t take the betrayal too kindly. 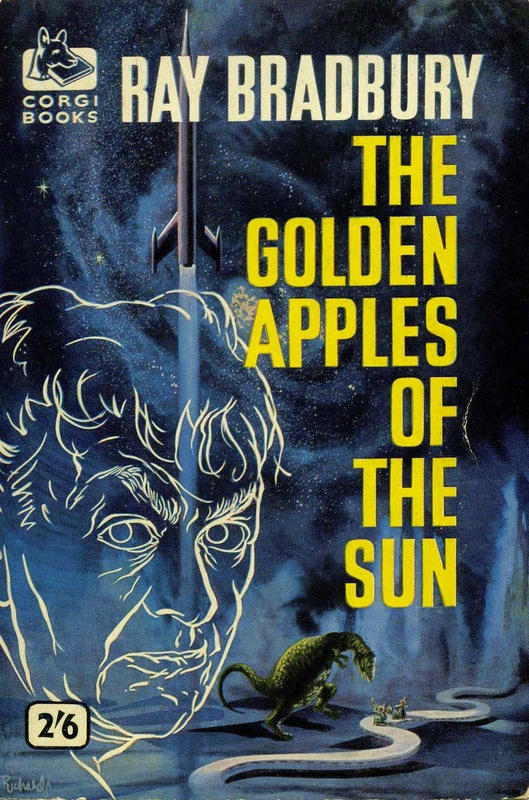 Ray Bradbury has written this allegorical story so incredibly well that you can picture yourself in the shoes of McDunn and Johnny and reliving their experience of the terrifying and lonesome monster and its tragic attachment to the tower. I get carried away with beautiful writing and intend to reread the story in future. I’d recommend it even to those who don’t usually read sf and fantasy. The Fog Horn appears to enjoy a cult status among Bradbury's many stories. It is the first one in his collection The Golden Apples of the Sun. It was made into a film called The Beast from 20,000 Fathoms, 1953, which incidentally was the original title till the author changed it. It is said to have been originally published in The Saturday Evening Post, 1951, though at least one site attributed its first appearance in Argosy the same year. The story has been adapted for plays, comics, and an animated series, and it even influenced a Star Trek episode. Charles, I read it for the first time and loved it. Prashant, it sounds like I would like this story. I do think the reason I like Bradbury's writing is because he "writes like a poet" as you say. Tracy, you will like this story, especially since you enjoy reading sf. Genre-wise, this isn't something I'd be expecting to read, but you make it sound unmissable Prashant. I will have to look it out. Moira, I hope you read this story out of the box. You won't regret it. Prashant, this is an unforgettable story. The loneliness of the creature is heart-rending. Neer, it's only nine pages long and there is so much depth to it. I'd say the fourth film of the Star trek (with the original cast) was influenced by it. I don't really recall an episode based on it but I might be wrong. Neer, I don't remember any of the episodes of STAR TREK though I enjoyed the William Shatner-Leonard Nimoy series a lot. Sergio, thank you! I started reading Bradbury seriously only in the last one decade and I still have a long way to go. I have read a few of his short stories though I haven't done justice to his novels. Prashant, I've not read him for at least 20 years, but I intend to read some of his mysteries at some point. I'll probably pass on this one. Col, this is far from what you read but you might still like it if you give it a try. I don't think I have read any of his mysteries. Love the man's work, agree he is a poet, and need to read this book. Thanks, Prashant. David, given your interest in poetry you'll love this story and I'd like to know your thoughts on it. Oddly, perhaps, Bradbury is a terrible poet. Todd, I'd like to think of it as prose-poetry. Yes, he's striving for poetic imagery in much of his prose...but he's a vastly better writer of prose than he is of poetry. He published a lot of weak poetry over his later decades. Todd, I haven't read a lot of Bradbury but, I agree, he has a way with prose and I enjoy reading it. It has been too long since I've read Bradbury. Maybe I'll track this book down and give it a try. Ben, I have been wanting to read Ray Bradbury consistently over a period of time but that hasn't been happening. The story was first published in THE SATURDAY EVENING POST 23 June 1951, and was reprinted in the August issue of the British edition of ARGOSY. Todd, thanks for setting the publishing date and year straight. I knew it was first published in THE SATURDAY EVENING POST but was surprised to find the story also featured in a 1951 issue of ARGOSY. That kind of transAtlantic republication particularly common in those years...most magazines didn't get too much international distribution until, at least, the 1970s, at least not between North America, Europe and the antipodes, despite even more obvious interest than there might've been in the SubContinent and other Anglophone audiences. Most of the fiction magazines had foreign editions in the 50s and 60s, for example, rather than simply ship copies internationally, as they would more often in the 1970s and 80s, at least. And Unz wasn't saying it was first published in ARGOSY, just that he was posting the ARGOSY (UK) issue it was in. Todd, I'd never seen or heard of these fiction magazines in Bombay in the eighties and nineties. It is possible that discerning readers may have been ordering the magazines directly. Even today I find only mainstream magazines and periodicals like National Geographic, Time and The Economist, and the usual celebrity-fashion-housekeeping journals in both new and secondhand bookshops. UNZ is a good site for a lay reader like me. THE SATUrDAY EVENING POST *was* the most "mainstream" magazine in the US for the first half of the 20th Century, Prashant...it lost much of its advertising base (and faced high production costs) by the end of the 1960s, but likes of TIME and THE ECONOMIST were minor titles in sales in comparison for the first half of the 1900s. The US ARGOSY sold very well indeed in those years, and I believe that the UK ARGOSY wasn't quite as familiar to anyone you'd meet in Britain, but was a common sight and widely read through the 1960s as well, and folded not long after. You didn't see them as a young adult because ARGOSY UK wasn't being published (there were two shortlived US revivals after he US version folded circa 1980), and the revived SEP has beem mostly a nostalgia magazine, with a small fraction of the old SEP's readership. Todd, thanks for all the information. I have read some of the early SATURDAY EVENING POST and ARGOSY issues though in case of the latter I don't recall which edition. Not all ARGOSY issues are in public domain. Haunting. I've read this several times and it always make me sad. Beautifully written, as are many of his stories. Richard, it is, indeed, "beautifully written." I will be seeking out Bradbury's other stories. His major influences in sf and fantasy were Theodore Sturgeon and Leigh Brackett, no slouches with prose themselves. Todd, I still have to read both Sturgeon and Brackett. Where do you think I should start? If you can find the books, I'd say E PLURIBUS UNICORN by Sturgeon, and THE BEST OF LEIGH BRACKETT collection, edited by her husband Edmond Hamilton (she edited his best of volume, too). I'll see what I would recommend online. Certainly the early story "It" in the magazine UNKNOWN on Utz, for Sturgeon. Todd, thanks again, for the recommendations. I'll look into both these and other titles by Sturgeon and Brackett. It’s our 25th Wedding Anniversary!